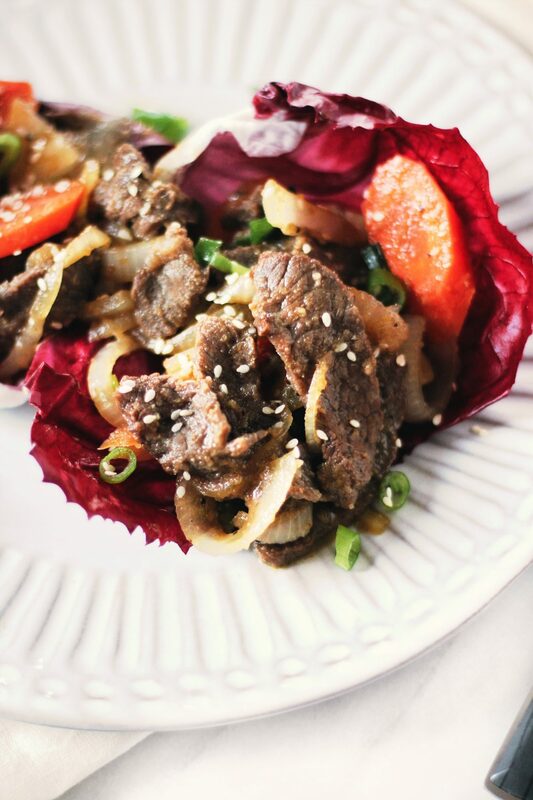 This Korean Beef Bulgogi comes from my friend Jean’s cookbook, Korean Paleo: 80 Bold-Flavored, Gluten- and Grain-Free Recipes. 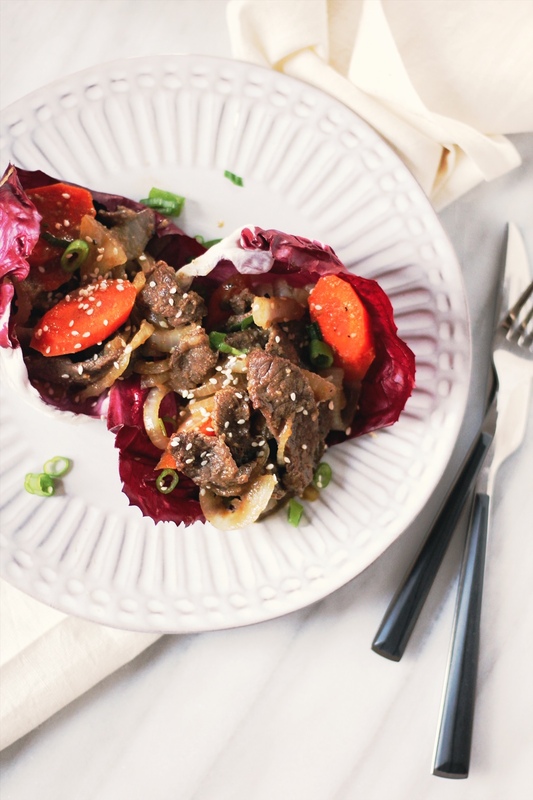 This beef bulgogi is Whole30 compliant, paleo, and gluten-free. I know a lot of you guys are currently doing the Whole30. 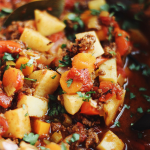 My most popular recipes have been Whole30 ones for the past 3 weeks, by far. While I don’t eat strictly paleo myself, I do the Whole30 once a year, and will be doing it next month. The last time I did the Whole30, my friend Jean was a life-saver for me. 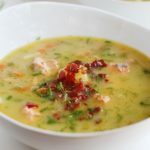 I went to her blog, What Great Grandma Ate, daily for recipes and inspiration. Jean follows a paleo diet and is a Nutritional Therapist. 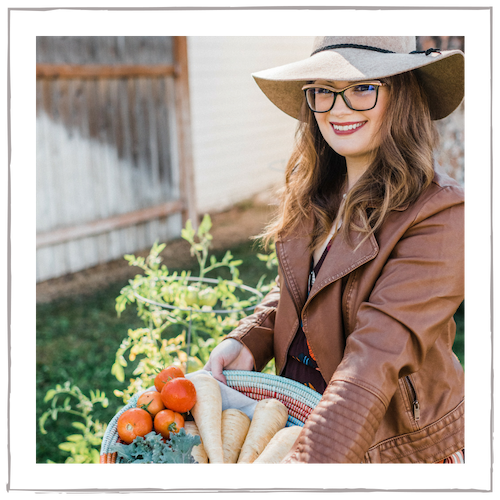 Her recipes are incredible and she’s very knowledgeable on all things health and healthy living. Plus, she has the cutest dogs. I mean, come on. Her new cookbook, Korean Paleo: 80 Bold-Flavored, Gluten- and Grain-Free Recipes is out now and it’s amazing. 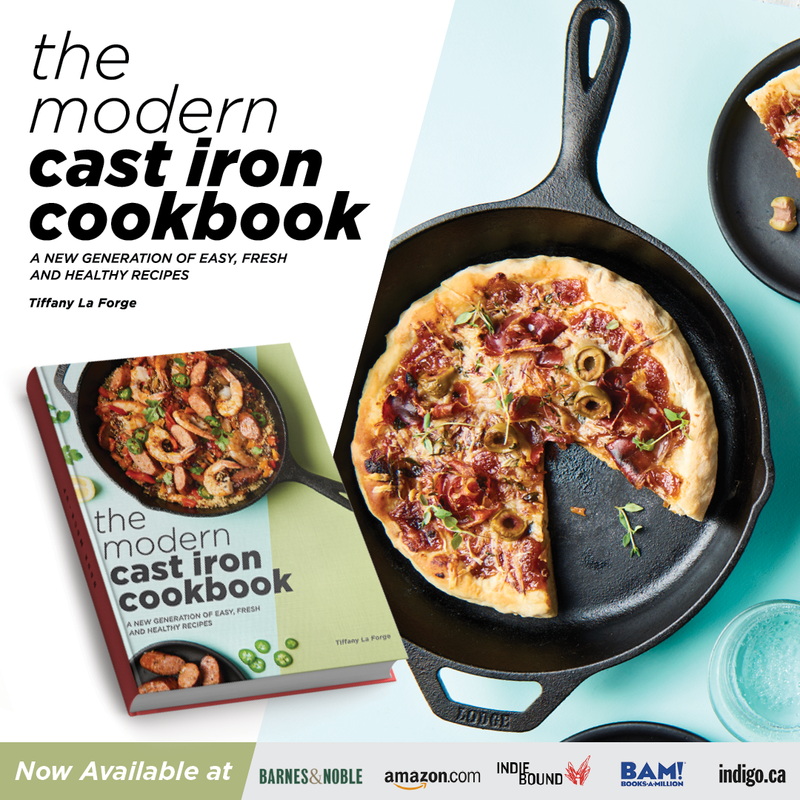 It’s filled with authentic, approachable, and completely paleo Korean recipes. I loved reading about her family, history, and her love and respect of Korean cooking. 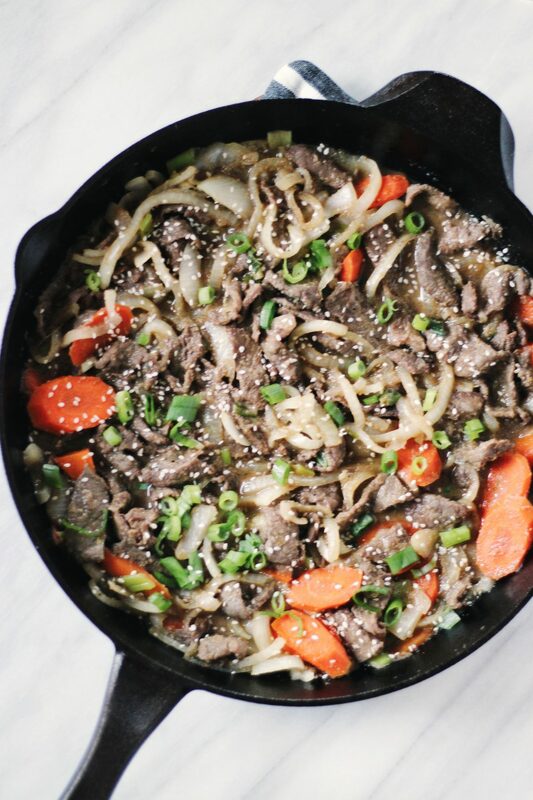 I made the Korean Beef Bulgogi from her book and am so excited to share it with you. 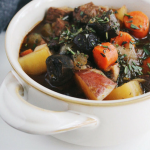 It’s so flavorful and incredibly easy. This Korean Beef Bulgogi is also paleo, gluten-free, dairy-free, grain-free, and Whole30 compliant. I can’t even begin to imagine just how many times I will be making this on my Whole30. The marinade for this Korean Beef Bulgogi is full of flavor—created with pear, coconut aminos, sesame oil, fresh ginger, garlic, and apple cider vinegar. Once the beef has marinated, this recipe comes together very quickly. I loved Jean’s tip of freezing the steak for 30 minutes to easily slice the beef paper-thin and ensure it absorbs the most flavor from the marinade possible. 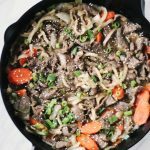 Honestly, whether you eat paleo/Whole30/gluten-free or not, you need to try this authentic and delicious version of beef bulgogi. 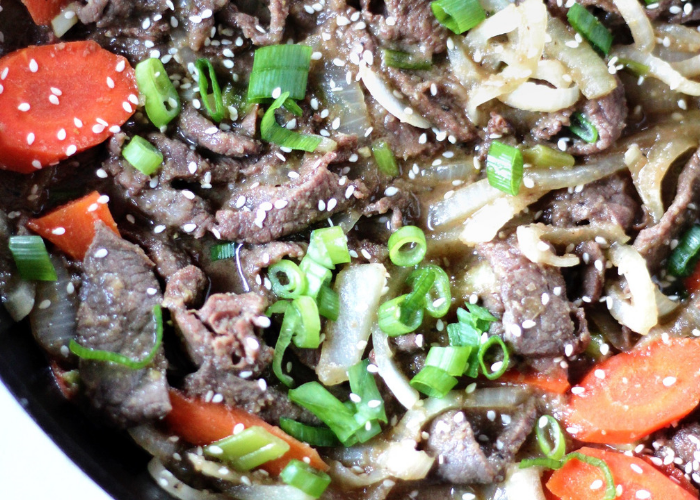 Thanks, Jean, for this incredible Korean Beef Bulgogi recipe! 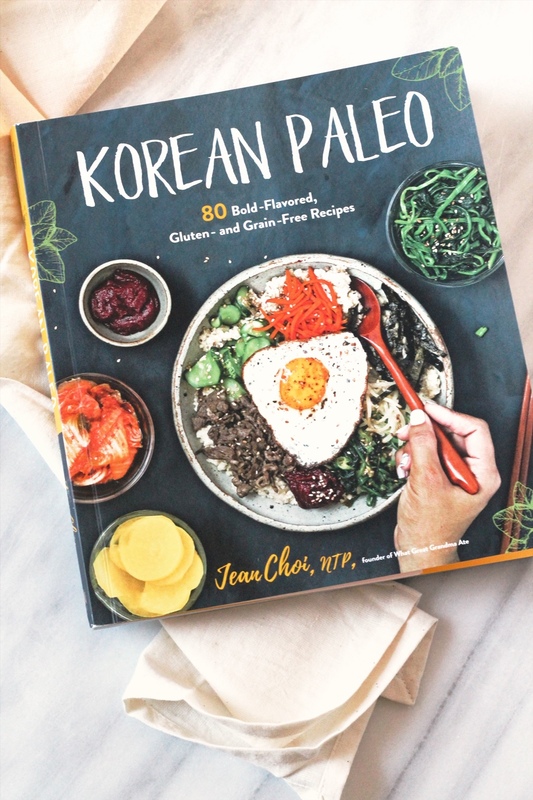 Check out Jean’s book, Korean Paleo, and buy it on Amazon now. This post includes affiliate links and are always products I love + highly recommend! Place the beef in the freezer for 30 minutes, then remove and slice it thinly, about 1⁄16 to 1⁄8 inch thick. 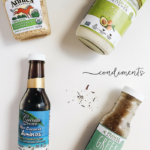 Place the coconut aminos, pear, sesame oil, ginger, garlic, apple cider vinegar, and black pepper in a high-powered blender. 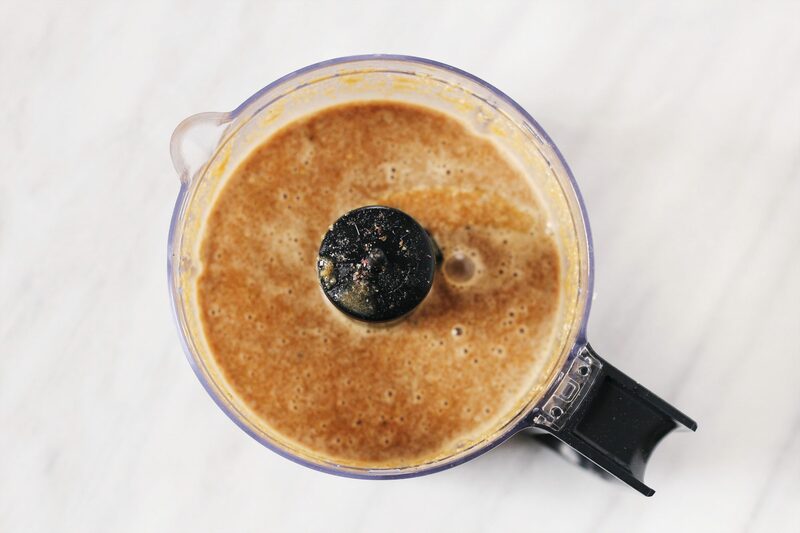 Blend well until liquified. Combine the sliced beef and the marinade in a large bowl. Toss and massage together with your hand until all the beef slices are coated in the marinade. Cover and marinate in the refrigerator for 1 hour (or overnight). When you are ready to cook the beef, remove it from the marinade, shaking off the excess. Slice the onion, green onions, and carrot. Combine the vegetables with the meat. Heat the cooking oil over high heat in a large skillet. Working in batches so you don’t overcrowd the pan, add the beef and vegetables and stir-fry together until the meat is browned and cooked through, about 5 to 7 minutes. Sprinkle with toasted sesame seeds before serving. Eat Bulgogi on its own or in a lettuce wrap. Korean Beef Bulgogi is one of my favorite dishes. I hope I can try your friend’s recipe and cook it over the weekend. Looks so yummy! When someone says Korean food, it’ll be almost always kimchi. For me, I like their meat dishes. Korean bulgogi is one that I really like. This looks like it would be absolutely delicious! I would love to be able to try something like this. I have never really had korean food before. I would’ve never guessed there was a Korean Paleo cookbook. Just when you thought you’ve seen it all. This looks fabulous! I love quick and easy dishes; perfect for my busy week! I love beef bulgogi but this is the first time I have come across a paleo version of it! I will have to try making this at home! 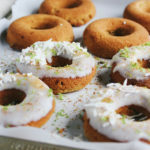 Thanks for sharing the recipe.I would love to try it out sometime when I get the opportunity. This is exactly what I’ve been craving lately! 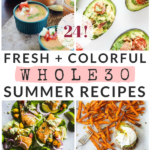 Looks absolutely delicious and I’m glad it’s Whole30 approved! I’ve never tried Whole 30 but I know there are people who swear by it. I can’t wait to try this Beef Bulgogi. It looks very tasty. 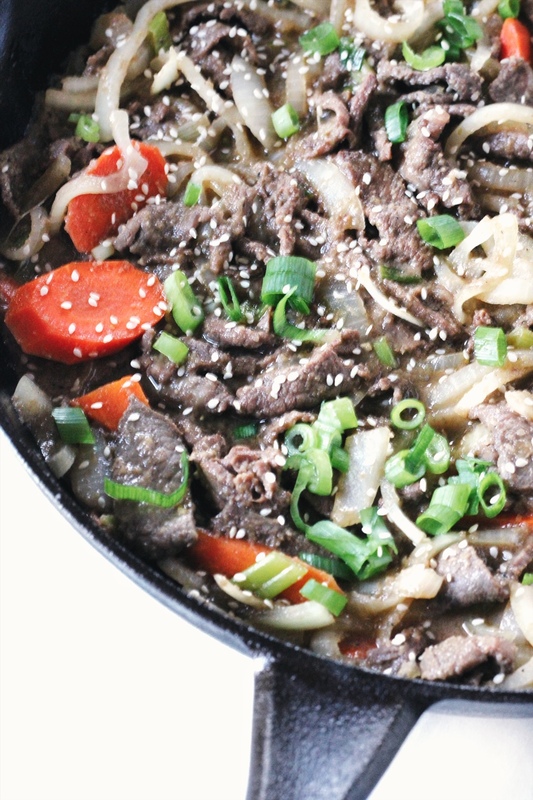 Thank you for sharing your Korean beef bulgogi recipe. Cannot wait to try it out. off to the supermarket now…. I love Korean food and always go to a Korean restaurant to order beef bulgogi because I have no idea how to make it. Thanks for sharing your recipe; now I cook it at home. I have to make this! I love Asian flavors, and this recipe is so healthy, to boot! Ouu, I love bulgogi! I’m going to re-create this using a plant-based protein. Thanks for sharing the recipe! !